If we want to job in garments then we need to know this things. Like we need to make a single jersey Fabric. But we didn't know the fabric count. Some people say through experience like you can use 26/28 count of yarn. It’s depend on experience. But if you want to know perfectly then you need to know the tricks. Before going to tricks, we should know what is count and GSM? 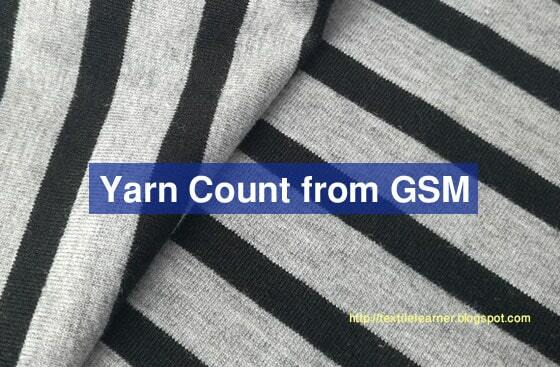 Yarn count is a numerical value which refers to the coarseness or fineness of the yarn. It is calculated by taking into account the length and weight of the yarn. The weight of the yarn is just the mass per unit length of the yarn. Fabric GSM refers to the Grams per Square Meter of the fabric. It is the weight of the fabric per square meter, measured in grams. Example: Single jersey fabric is 130 GSM. Now find the yarn count? You can make this kind of fabric with 32/34 count of yarn. So you can make fabric with 32 count of yarn.